Sterling Mennonite Fellowship, July 2017. The Sterling Mennonite Fellowship in Winnipeg, Manitoba began services in 1951, and formally organized in 1958. The first building was occupied in 1956, with subsequent building programs in 1969 and 1981. Frank J. Dyck is considered the founding leader of the group. The congregation originated through urbanization from rural Manitoba. The group was known as St. Vital Mennonite Mission until its formal organization in 1958. It was a city mission begun as a joint effort of the Sommerfelder, Rudnerweider, and Bergthaler churches and with outreach of students from Canadian Mennonite Bible College. Two fellowship groups which met in the homes of Corny Derksen and Jake Derksen decided to rent the Greendale hall in St. Vital for the purpose of establishing a mission church. Ministers D. D. Schulz and D. D. Klassen helped advise and organize the group in 1952. The congregation met in the church building at 18 Sterling Avenue until the end of March 1970, when a new building was completed at St. Mary's Road and Marvin Place. 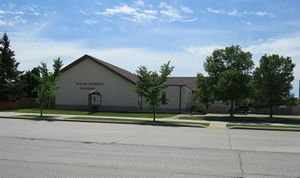 Their name was then changed to "Sterling Mennonite Fellowship", which it retained when it moved to yet another new building in 1980 at 1008 Dakota Street at Nova Vista Drive. The language of worship is English and German; the transition from German occurred in the 1950s. Canadian Mennonite (27 November 1953): 3; (28 November 1958): 4; (20 May 1960): 14. Heppner, Jack. Search for Renewal: the Story of the Rudnerweider/Evangelical Mennonite Mission Conference 1937-1987. 1987: 96, 162. Loewen, Gary and Dave Martens. "Sterling Mennonite Fellowship." Research paper, Canadian Mennonite Bible College, 1979, 139 pp. Mennonite Heritage Centre. Epp, Marlene. "Sterling Mennonite Fellowship (Winnipeg, Manitoba, Canada)." Global Anabaptist Mennonite Encyclopedia Online. February 1989. Web. 24 Apr 2019. http://gameo.org/index.php?title=Sterling_Mennonite_Fellowship_(Winnipeg,_Manitoba,_Canada)&oldid=149073. Epp, Marlene. (February 1989). Sterling Mennonite Fellowship (Winnipeg, Manitoba, Canada). Global Anabaptist Mennonite Encyclopedia Online. Retrieved 24 April 2019, from http://gameo.org/index.php?title=Sterling_Mennonite_Fellowship_(Winnipeg,_Manitoba,_Canada)&oldid=149073. This page was last modified on 18 July 2017, at 16:28.